The surge has been fueled in part by the anti-vaccination movement - most people who contract measles have not been vaccinated, the CDC said. If one person has the disease, up to 90% of the people close to that person can become infected, the CDC warned. Most of the U.S. cases this year involve 17 outbreaks - defined as three or more localized cases - including some underway in New York, New Jersey, Washington, California and Michigan, the CDC said. 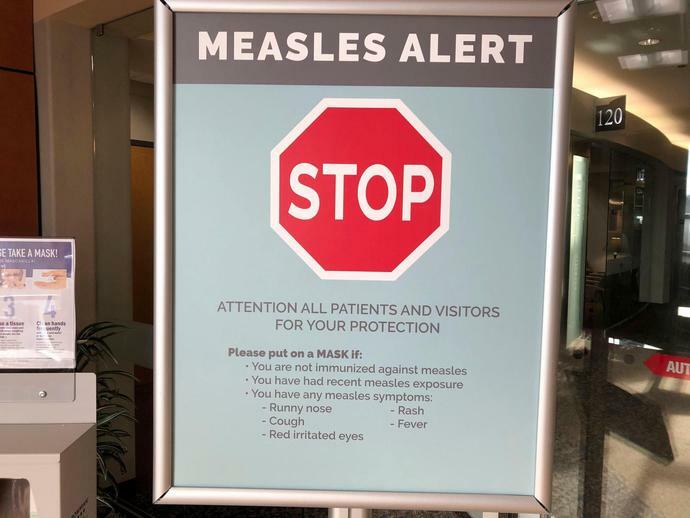 The outbreaks are linked to travelers who brought measles back from countries including Israel, Ukraine and the Philippines, the CDC said. With fewer people getting vaccinated, measles is on the rise. New York City's Department of Health defended its mandatory measles vaccination order in a state court on Thursday after a group of anonymous Brooklyn parents sued, arguing that the order was unconstitutional. The outbreak has infected 329 people so far, most of them children from Orthodox Jewish communities in Brooklyn. The order, which was extended this week, requires unvaccinated people living in certain affected Brooklyn neighborhoods to get the measles-mumps-rubella vaccine if they cannot otherwise demonstrate immunity to measles, or face a $1,000 fine.